Acorus calamus, also known as sweet flag, is a wetland plant grown for its attractive foliage and the sweet scent emitted when the leaves are crushed. It is very easy to grow in almost any environment as long as the soil is boggy and wet. Acorus calamus has slender, sword-shaped leaves similar to iris or cattails. These grow three to five feet in height and sway gracefully in the wind. 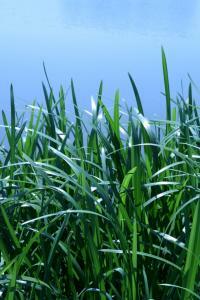 It can be thought of as an ornamental grass for wet places. The flowers are insignificant white and green spikes hidden low in the foliage. Sweet flag is hardy in USDA zones 2 through 10. It will grow in shallow standing water or anywhere that the soil is not allowed to dry out. Use it in pots to spruce up water features or as a way to vegetate naturally wet areas of your yard. Sweet flag spreads by rhizomes just beneath the surface, but is not particularly invasive or aggressive. Other than ample moisture and full or partial sun, it has no other growing requirements and is not bothered by pests or disease. The only annual maintenance required is to cut the foliage to ground in fall after it turns brown. Sweet flag grows well without division, but anytime additional plants are desired they are easily obtained by digging up a clump and dividing the rhizomes. This is a traditional medicinal plant in many cultures and has been attributed with a wide range of properties, ranging from being an aphrodisiac to a hallucinogen to treating stomach troubles. Its aromatic properties have found their way into incense, herbal teas, smoking blends, and essential oils. It is said to have been one of the plants found in Tutankhamen's tomb in Egypt and has been utilized in almost every corner of the globe from Native Americans on the Great Plains to European herbalists in Medieval times to the ancient Chinese. For medicinal purposes, the roots are the primary part used, which should be harvested in fall after the foliage dies down. 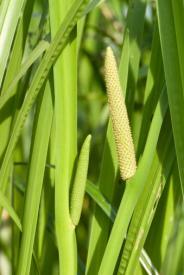 In addition to the basic species, there are a few cultivars of Acorus calamus worth noting. Sweet flag is commonly available in garden centers, either with the bog plants or for the dwarf varieties below, in the groundcover section. 'Variegatus' has longitudinal stripes of a creamy white color along its two to three foot leaves. It is hardy in USDA zones 4 to 9. 'Ogon' has golden yellow leaves and grows to about 12 inches tall and is hardy in USDA zones 6 to 11. 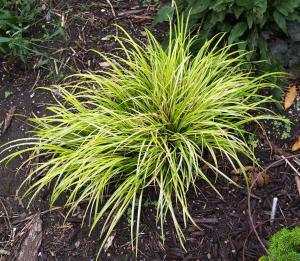 'Minimus Aureus' is also golden yellow, but reaches just four inches in height and is hardy in USDA zones 5 to 9. Sweet flag won't knock your socks off with huge flowers, but it is a graceful understated plant. Both the basic species and the colorful cultivars are indispensable as foliage plants in the garden designer's repertoire.